After the Norman Conquest Colton had three Manors. Azeline occupied the Manor around the church and the lower end of the village that subsequently became known as the Church Manor. The Manor house is thought to have stood close to the church. 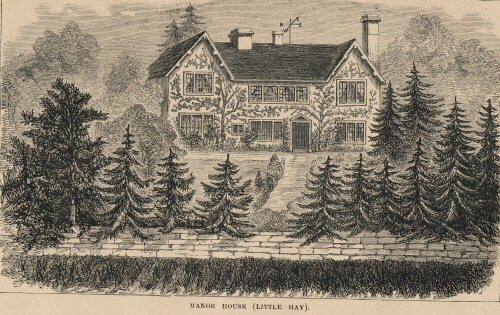 He also occupied the small Manor of Little Hay. The house for this Manor has always been in the same place in the centre of the village. In the 13th. Century this manor passed into the hands of the Bagot family of Blithfield Hall and remained with the family until well into the 20th. Century. There is still a house standing on the site today albeit a 19th century one. A sketch was made of its Elizabethan predecessor and the chimneys still stand in the garden. The third manor was on land to the west of the village bordering the River Trent. The water mill on the Trent belonged to it. This Manor and the Church Manor were amalgamated into one at the marriage of Thomasine De Wasteney and Nicholas Gresley in 1365. The Manor house was where Colton Hall Farm stands today. In the 17th. Century when Walter Aston owned the Manor, the house was said to be of a large timber construction with many rooms. This house burned down in the late 17th. Century. .
His subsequent heirs built Bellamour Hall situated close to the road running from Rugeley and the remains of this Hall can still be seen today.. A second larger Bellamour Hall was built close to the first. The Manor passed by marriage to the Blounts in 1766. It was later then sold first to the Oldham’s, a retired Indian Judge and then to the Horsfall’s who was MP for Liverpool. The second Hall was sold in the 1920’s and was demolished soon after.